We wrote up Google’s spectacular Star Wars themes for apps yesterday, but today, another disturbance in the Force has been felt, originating from the folks down in Mountain View. 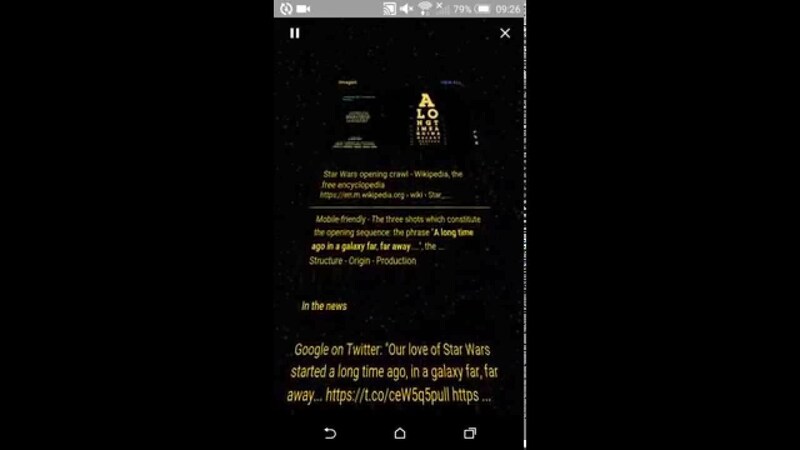 An easter egg has been discovered in Google Search, one which turns your entire list of search results into a text crawl, just as we see in the opening of every Star Wars film. It’s not exactly practical in terms of getting all of your information, but it’s fun to watch. In order to make this easter egg appear, type “A long time ago in a galaxy far far away” in the Google Search bar on a phone, tablet, or desktop computer. Once you hit enter, you should see a fancy transformation take place, with all of the search results, including videos, turned into a text crawl with yellow text and starry background. Not only that, but Google even plays the music to accompany the text crawl. It’s a beautiful thing. Watch the video below on how to perform the easter egg, then give it a shot yourself and show everyone else in the office. I am sure they will love it, unless they don’t appreciate Star Wars. In that case, don’t talk to them anymore.